Well here we are! We’ve abandoned our MySpace blog and officially relocated. For historic postings go here. All subscribers to http://feeds.feedburner.com/zentornado will be automatically redirected. We’ll be posting newsletters, performance listings, videos, photos and special promotions here. In the meantime, here’s a video from the very beginning. The video, which is unfortunately quite grainy as a result of dim lighting in the venue, was filmed in August 2003 at the Mars Bar in Seattle, where we were performing as part of HipSync Records’ Electric Bebop Concert Series. This was the earliest incarnation of Zen Tornado, even before we had named the group. The band is myself, James DeJoie in baritone saxophone, James Whiton on acoustic bass and Simon Grant on drums. 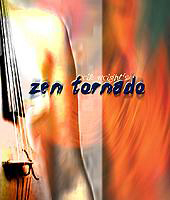 This entry was posted in Newsletter, Videos and tagged Rik Wright, Zen Tornado on December 31, 2010 by Sunrise Pixels.